In my last post, I discussed the importance of your child's coach being a good teacher; someone who both understands the sport and how to communicate his or her knowledge. I talked about the coach who not only teaches skills, but also conveys the game's values. Let's dig a little deeper and talk about how a youth coach goes about achieving these ends. Let's focus on the "positive" approach to coaching, the one that most of us agree provides the greatest benefits to the largest number of kids. Believes in kids–expects improvement. For each child under his or her tutelage, the exceptional coach sees opportunity for growth. This coach does not accept the child’s ability as fixed, but instead recognizes the areas in which the child may eventually excel. He or she can see how certain attributes (size, quickness) are compensatory—providing success in areas other than the ones in which they present a more obvious weakness. This coach sees the entire spectrum of ability, both existing and latent, and is able to find ways in which each child can succeed. 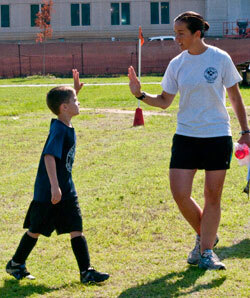 The exceptional coach believes in each child and the child’s potential to find enjoyment in playing the sport. And most importantly, each child begins to incorporate this belief into his or her own sense of what’s possible. Uses positive language to sandwich criticism. Whenever possible, a coach should use the “sandwich” technique while instructing. A coach should first encourage the player on what he or she was doing right; next, state the problem; and finally, indicate what action or behavior the player should have taken [what was done right – the problem – best action]. For absolute beginners, struggling younger players, and children with more sensitive personalities, a coach can soften the criticism and emphasize the positive. Older, more experienced players, on the other hand, respond well to constructive criticism—especially when they understand that their coach appreciates their talent and has higher expectations for them. Frames difficult situations as either an opportunity or lesson learned. Practices and games in youth sports are filled with failure. Overmatched beginners, players having less athletic ability, and teams missing key components, will all struggle against superior opponents. From a purely win-loss perspective, there are lots of losers. Here's a simple example. During the basketball season, I will occasionally have my players run a “Suicide” race where each player progressively touches lines further down the court, always returning to the starting baseline. I don't use this race to get my kids in shape or to punish them for poor performance. Instead, it's sometimes useful to regain their attention or to simply have some fun. (Many enjoy the challenge of the race even though they'll moan and groan about it.) But here's the problem. On most teams, there are children of different ages, sizes, and athletic ability. There are always one or two children who will win the race and a couple of other children who will usually finish last. Although this drill may appeal to the fastest ones, it’s not inherently fun for the slower ones. But by shouting words of encouragement to these children, giving attention, and casting the race as one against another player of similar ability (or even themselves), a coach can get these players’ best effort. Although they lose the overall race, they still strive to do their best. They work hard; they persevere; they learn to take pride in their effort. A race lost from the start is “framed” to achieve a positive result. Losing a game is a failure—but it also represents a great teaching moment. If a coach frames the loss as a lesson learned, and practices to overcome the problem, the players will also view the loss as a necessary part of growing and becoming better players. Likewise, when playing a superior opponent, a coach can cast his team in the role of the underdog—and emphasize the opportunity for his players to play their best and relish the challenge of possibly upsetting their more talented opponent. When you're considering the merits of your child's youth coach, keep in mind the above three qualities. In most instances, your child will benefit from a knowledgeable coach who uses a positive approach. Besides providing skill instruction, these coaches engage your child in a way that builds self-esteem, confidence, and a joy for the game itself. Thank you, thank you, thank you. Some common sense in this crazy world of youth sports.